For the musical genre, see Dawr. For the ancient near eastern city, see Ed-Dur. 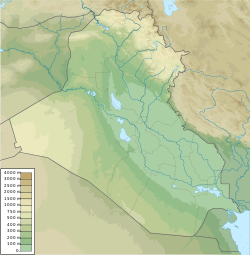 Ad-Dawr (Arabic: الدور‎; pronounced similar to "door") also known as Al-Dour, is a small agricultural town near the Iraqi town of Tikrit. Populated mainly by Arabs, ad-Dawr is home to a housing complex called "Saad 14", which was built by Hyundai Engineering & Constructions Inc., a major South Korean construction company, during the 1980s. One of the most well-known Arab historical scholars, Professor-Doctor Abdul Aziz Al-Douri (b. 1918 – d. 2010), was a native of ad-Dawr; he served as the chancellor of Baghdad University during the 1960s. In May 2003, the 4th Battalion 42nd Field Artillery, a part of the U.S. Army's 4th Infantry Division, along with the 534th Signal Company, established a Forward Operating Base just south of the town, called FOB Arrow. On May 15, 2003, troops from the U.S. Army's 4th Infantry Division raided the town, arresting more than 260 suspected Baath Party supporters. The vast majority were soon released but five Iraqi special security forces officers were reported captured, including two Iraqi army generals and a general from Saddam's security forces who had disguised himself as a shepherd. On August 13, 2003, a U.S. Army soldier was killed near FOB Arrow when his vehicle hit an anti-tank mine. An attack near ad-Dawr killed three American soldiers and injured three on September 18, 2003. The 4th Infantry Division's 4th Battalion 42nd Field Artillery, along with 3rd Platoon 534th Signal Company adopted the Nasiba Primary School for Girls in the town and completed its refurbishment in November 2003. On December 13, 2003, the 4th Infantry Division's 1st Brigade Combat Team conducted Operation Red Dawn and found Saddam Hussein hiding in a spider hole in front of a hut occupied by a man believed to be his former cook, Qais Namuk.